Hivos Director of Operations Sanne Nolst Trenité recently toured selected projects in Harare, Zimbabwe and also held a townhall-type meeting with all staff in the Southern African region. 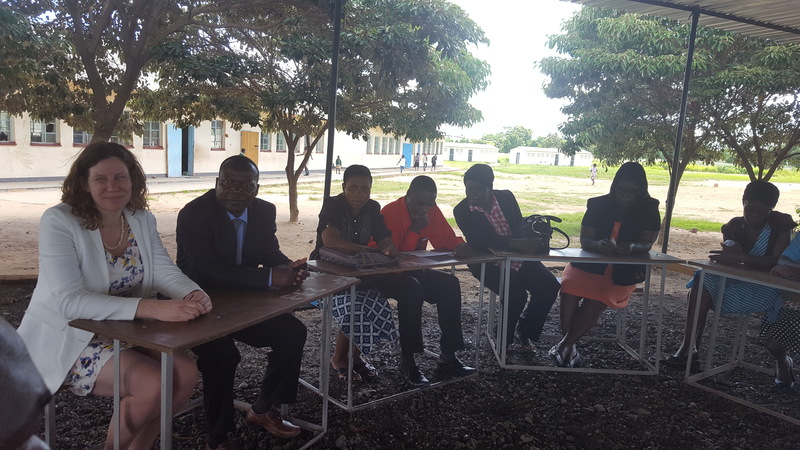 Members of staff for Malawi, South Africa, Zambia and Zimbabwe had an opportunity to interact and engage with the DOO on the trajectory of the organizations as well as air out any outstanding issues. “Harare is the first place station that I visited following my appointed. So it feels like home to be here. Harare has a special place in my heart,” said Trenite. While in Zimbabwe, Trenité tried visited Hivos Southern Africa’s project partner in Chitungwiza, a spawrling high density suburb, approximately 30 kilometer’s south of the Harare, Zimbabwe’s capital city. In Chitungwiza, Trenite had the opportunity to participate in a community engagement by Hivos Southern Africa’s partner, Zimbabwe Democracy Institute (ZDI), aimed at promoting good governance and increased awareness of constitutional rights at community level. Zimbabwe Democracy Institute (ZDI) in partnership with Chitungwiza Residents Trust (CHITREST) have been promoting knowledge of human rights guaranteed in the constitution among residents in Chitungwiza. Trenite then visited a child about free zone in Epworth, another high density suburb locate d approximately 20n kilometers. The Stop Child Labour project advocates for good formal education for children and a decent income for adults. Child labour has been on the rise in recent years in Zimbabwe fueled by poverty, missing parents, poor legislation and a lack of social services. Child labour jeopardizes the physical, mental or moral well-being of a child and perpetuates the vicious cycle of poverty within communities. Hivos Southern Africa Hub has been partnering with the Coalition against Child Labour in Zimbabwe (CACLAZ) to bolster efforts to stem child labour through the promotion of area based zones that shun child labour in both rural and urban settings. Due to the prevalence of child labour in Epworth, the town was selected in 2014 as a pilot area for the implementation of an urban focused child labour free zone concept. A child labour free zone is a defined area, such as a village or a plantation, where teachers, local authorities, village leaders, employers, parents and children in these zones work together to get children out of work and into school. In Epworth, the Kubatana Primary School serves as an incubation centre for integrating children involved in child labour into the conventional educational system. The incubation centre is expected to provide services such as counselling, health checks, accelerated tuition and family reunion among many others.